MagLoft is jam packed with all the professional features you need to create amazing looking digital publications and mobiles apps, but for a fraction of what our competitors are charging! Already have your own website where you offer magazine subscriptions or issues? Save the hassle of manually adjusting your readers’ purchases by connecting your website with us! Read more about our WordPress Plugin here. 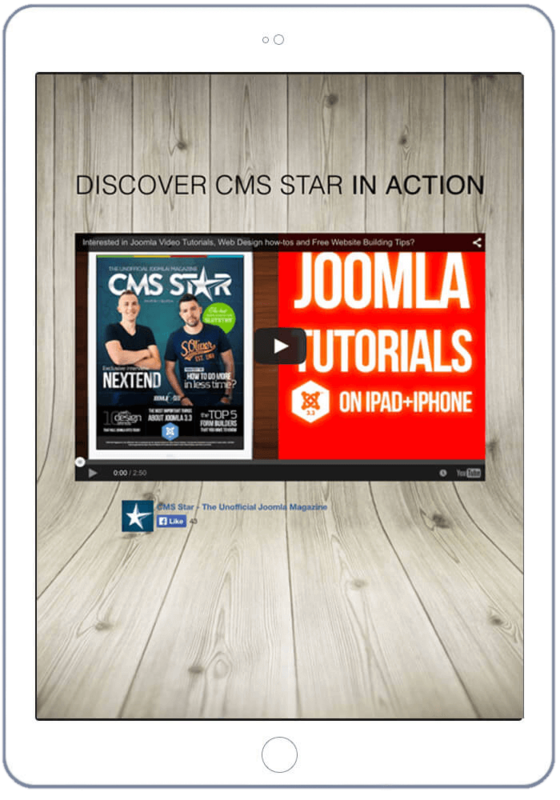 It’s super important that your content is easily readable on smartphones and tablets. The regular PDF replica magazine is unreadable on smartphones and it leaves readers with a poor impression of your publication. With responsive design, your content will resize and scale automatically to fit any device size, resolution and orientation. 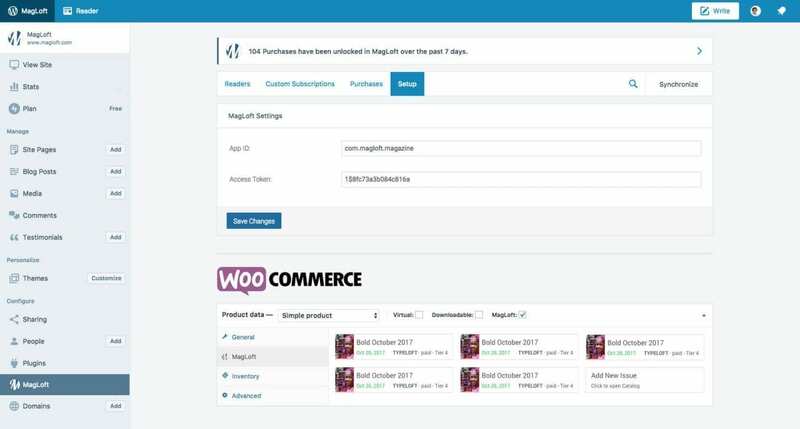 MagLoft connects smoothly with your existing WordPress Website, Membership site or Online Store. We have intelligently designed Plugins that take away the pain of setting everything up and synchronizing your purchases with MagLoft. And in case you are using a custom solution: We have API Libraries and Code Snippets ready for most programming languages. Static content is boring and your readers will quickly realize that. Flipping through a PDF isn’t very exciting and you need to add more fun content to keep readers engaged. The standard for interactive content today is audio and video. This is a great start which adds life to your publication, but why stop there? 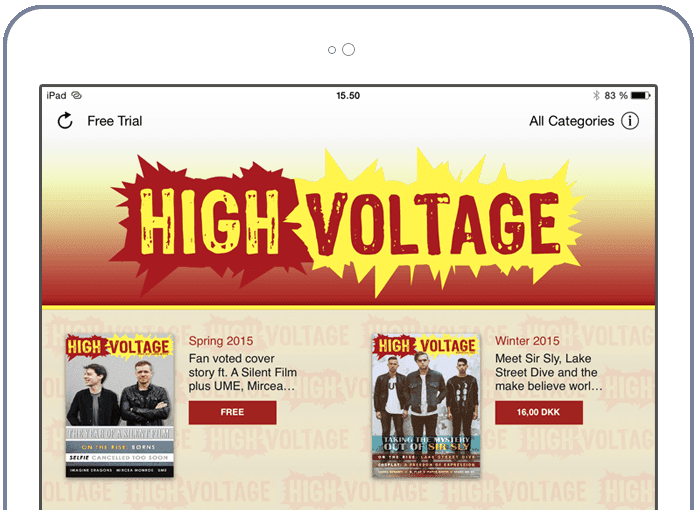 Anything that can be built for the web can be used in your magazines! Be it simple slideshows, animations or even games. With MagLoft there are no limits to what you can create and we are also compatible with content from other programs like Tumult Hype and even Unity3D! Push notifications is a powerful feature to re-engage your readers and remind them to come back and read your magazine. Send push notifications that automatically and instantly start downloading new issues in the background. This way readers can access new content without having to wait for it to download. Reach out to readers that have yet to subscribe and remind them of your special subscription offers. Forget about having to code or other complex ways of updating the look and feel of your app. Almost every aspect of your apps design can be updated from the online web portal. See your changes instantly update in your apps! It’s way too expensive to hire a developer to build your apps and you don’t have the time to explain and wait for them to finish. Simply select a few options in MagLoft and click the submit button … bam! We take care of all the technical setup of your apps for you. MagLoft supports PDF, FOLIO, ARTICLE, EPUB and HPUB formats which makes it very easy for you to reuse existing content. We are always adding more formats and soon we will support articles as well as issues. 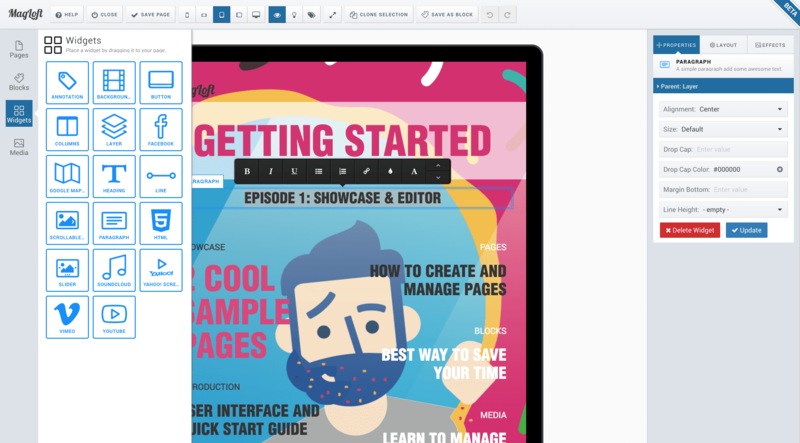 Creating a new fully responsive issue is crazy simple with MagLoft. 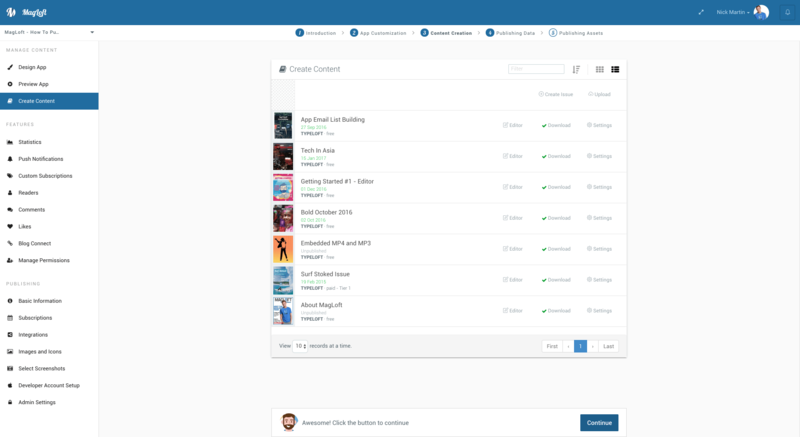 You can select between a range of themes that will automatically create template pages for you. Simply copy/paste your own content and you’re done! 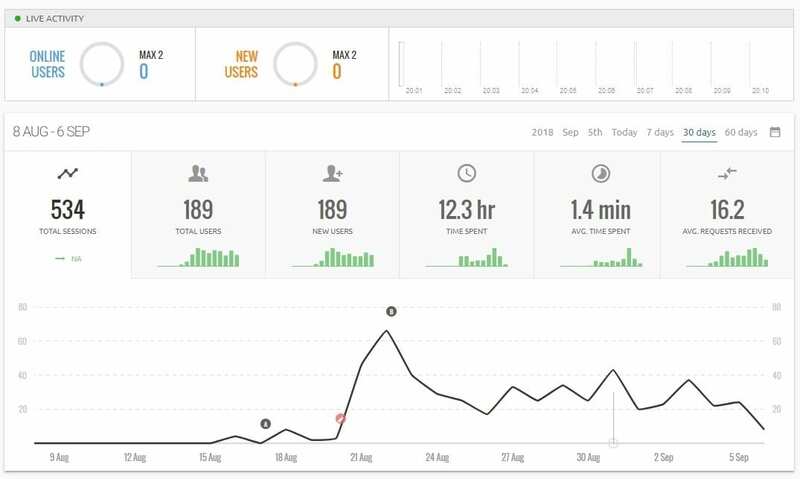 MagLoft provides a full-fledged analytics Platform, which allows you to learn, optimize and take control over your Audience. 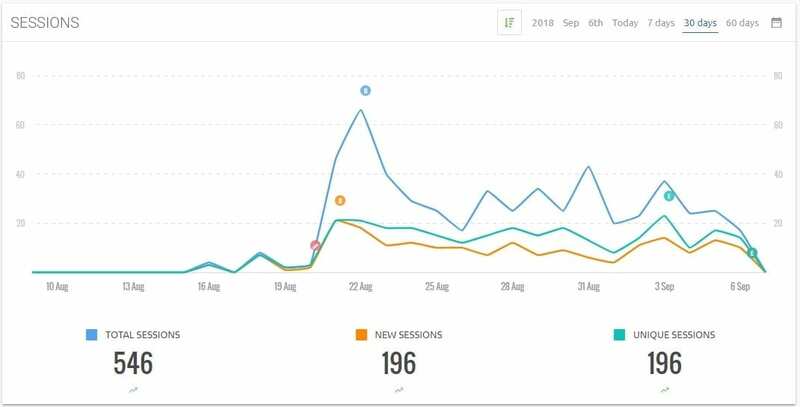 Learn how well issues are performing in terms of downloads and views, understand which pages your readers like the most and spend most of their time on and which links and interactions they engage with. You can further create powerful cohorts to build target groups for push notifications and special offers, based on your readers experience with your apps. 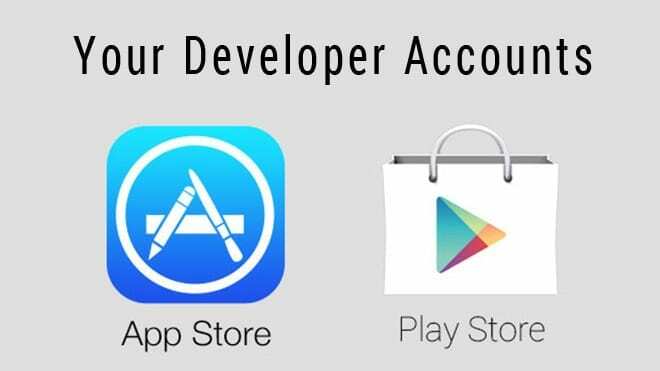 Use your own developer accounts to remain in 100% control of your apps and revenue! This option is available from our Professional plan and up. Starting with a free magazine? No problem! Use our Standard plan and upgrade when you are ready. We will transfer your app to your own account. This is your homepage as soon as you open up the MagLoft portal. Whether you want to create new issues, customize your apps, or analyze past performance data, all our features is accessible from a simple left panel menu. 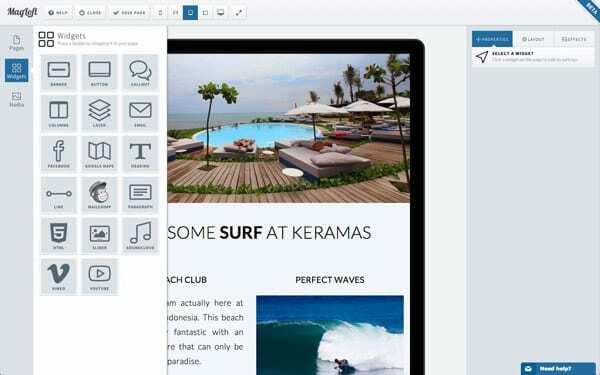 The TypeLoft Editor is a powerful drag-n-drop visual editor that you can use without leaving your browser. 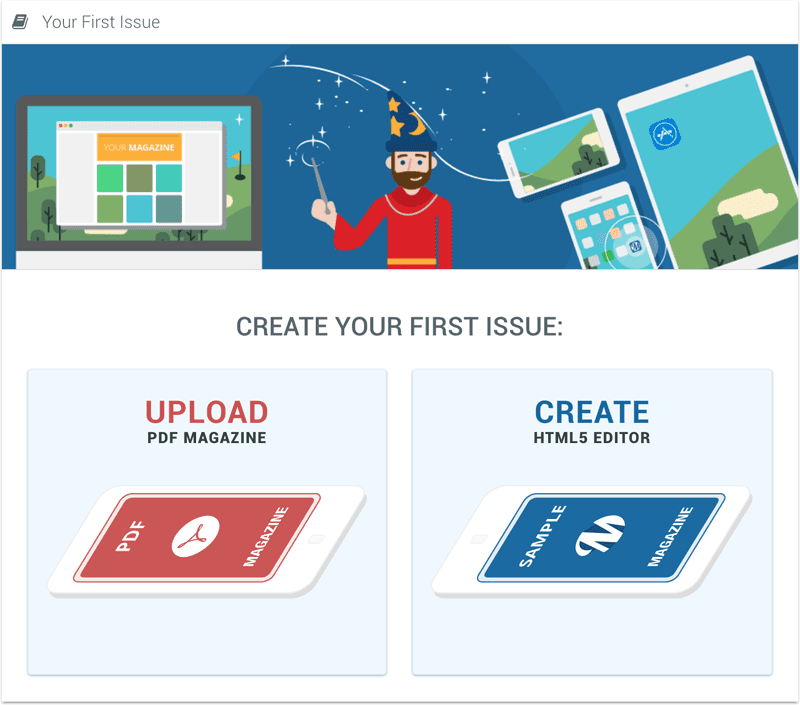 TypeLoft allows anyone to become a digital magazine publisher, even if you have zero coding and design experience! 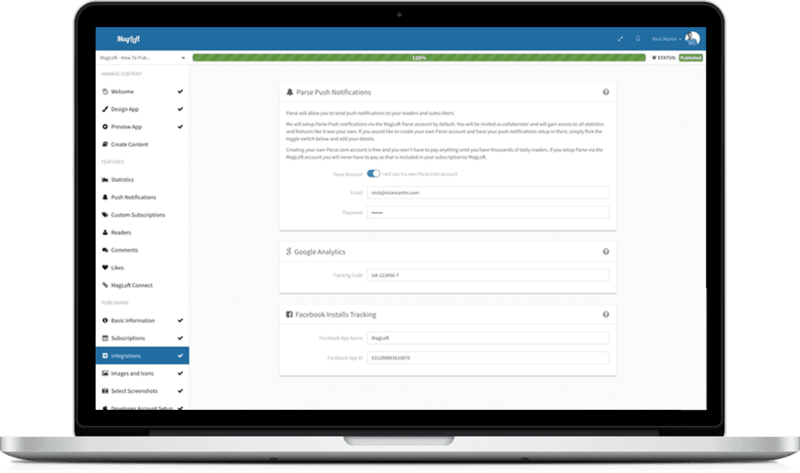 With custom subscriptions you can add your existing subscribers. This will allow subscribers to access any content that would otherwise be locked in your apps if content is premium or hidden. Simply add an email address to allow existing subscribers the ability to login to your apps and access content instantly. Get an overview of all your readers and the products that they have access to. 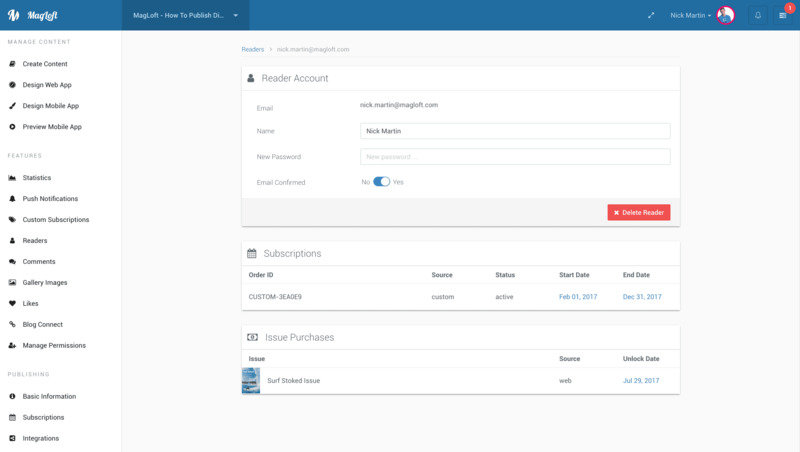 With a simple click you get to see many details of your users and which subscriptions and single issues they have access to. 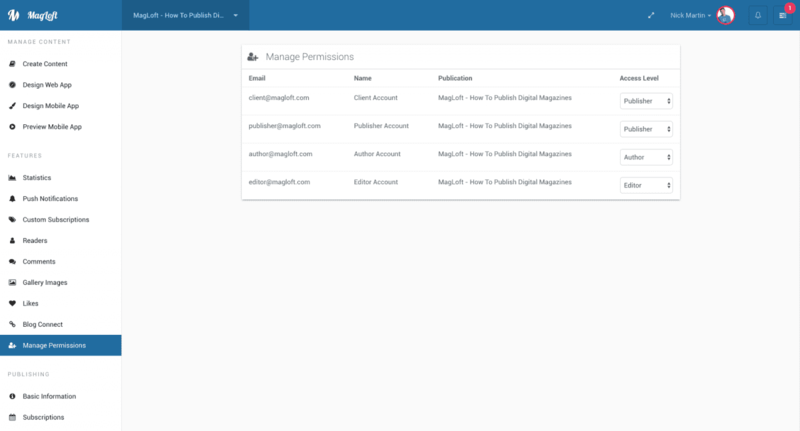 MagLoft comes with built in client management for multiple publications. 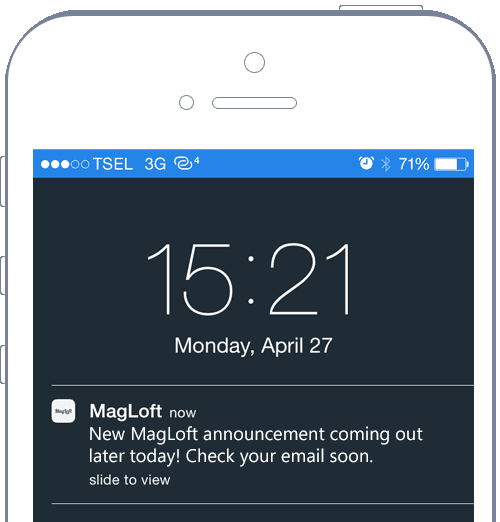 MagLoft makes granting specific access levels to specific clients or team members incredibly simple. Just invite them via email to your publication and apply the corresponding access level.